Although camps and neighborhoods received plenty of attention from slasher movie filmmakers of the early 80s, without a doubt, the biggest sub-genre of the stalk and slash cycle belonged to higher education. The Initiation, Splatter University, Hell Night, Terror Train, Night School, etc. all feature a campus or college atmosphere as the basis for the story. 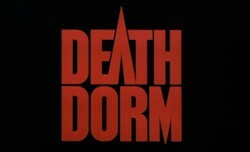 Perhaps the campus slasher with the most memorable title was The Dorm That Dripped Blood. Like many forgotten slasher movies, The Dorm That Dripped Blood has been given new life on home video. 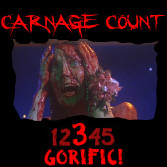 One of the more notorious of Britain's "Video Nasty" list, for years, fans have clamored to experience the movie as it was intended by its creators... very violent and very bloody. Enter Don May Jr. and Synapse Films who have gone the extra mile to help make sure that modern audiences view the film as more than just a fake-sounding title name-dropped by Randy in Scream 2. Dayton Hall is about to be torn down, and a handful of bored-looking college students are staying at the end of the semester to help prepare it for demolition. Someone in the shadows is about to do a little demolishing of his or her own. As you may have suspected, a mysterious slasher is tenderizing, drilling, and boiling his or her way through the students (and pretty much anyone else that gets in the way) one by one. Could this be the work of a random, deranged maniac? Or will the identity of the killer hit closer to home? Will anyone be alive to tell the tale of the dorm that dripped blood? Most importantly, will the audience members be awake by the end of the film? I was really hoping for good things out of this one, but all I can really do is shrug. It is watchable in a bad movie sort of way, but is far from a classic. Even though every slasher movie is essentially the "same" at their core, none feels more the "same" than this one. The plot is the most threadbare of just about any I've ever seen. Very little is given in the way of character backstory or even backstory of the college or dorm itself. No spooky stories about a murderous incident from years past... no tragic accidents... nothing. Just a dorm and students hanging out. The movie starts, the killer stalks, the killer kills, repeat. Very little attention is given to the killer's presence, with the exception of violence of the kills. Instead of a creepy mask or giallo-ish black leather gloves, we do see the killer wearing bellbottoms and sneakers. Not very intimidating, unless the killer happens to be Andy Gibb. The killer does kill in a particularly brutal fashion, utilizing a power drill and spiked baseball bat among other things. The acting in the movie is quite abysmal. With the exception of Daphne Zuniga (The Initiation, Spaceballs) you've likely never heard of any of the cast members. To save their own embarrassment, that's probably for the best. The directing and writing aren't very impressive either. Hard to believe it took three screenwriters to write this simplistic mess. In many ways, The Dorm That Dripped Blood feels more like a student film project than an actual movie. Shots are assembled in a very pedestrian way and dialogue is delivered with the zeal of a corporate sexual harassment video. As a slasher of the "mystery" variety, there are literally no clues dropped as to the killer's identity could be, making it frustrating for the audience to play along. Once the killer's identity is revealed, you'll probably just shrug. For the lack of clues given, the killer could truly have been anyone. Final Exam was fairly pedestrian and featured a anonymous killer as well, but where that film excelled was in its memorable characters like Raddish and Wildman. Here, there are no such memorable faces. The film does manage to have a few positive aspects. Christopher Young’s score is near perfect, and deserving of a far better horror movie. The makeup and special gore FX by Matthew Mungle are hit and miss (the misses, mostly due to lack of budget), but he does manage to pull off a few pretty decent kills. The nailed baseball bat and the electric drill are two standouts. Though it may be trivial, I’ve always enjoyed the film’s title, The Dorm That Dripped Blood. Sadly, the title is much better and more memorable than the movie itself. I never understood the alternate title, "Pranks". That I could tell, pranks had almost nothing to do with the plot. One of the characters puts a fake spider in someone's egg. That's all that I can recall, off-hand. The Dorm That Dripped Blood has finally received a legitimate DVD release by Synapse Films, and on top of that, fans have been given a high definition Blu-Ray release in the same package. Most importantly, this release is the uncut version (under the alternate title, "Death Dorm"), not seen in decades. The transfer is decent, but definitely has its rough spots. On the whole, Synapse has done a pretty impressive job. If you’ve only seen the film on VHS or via the not-exactly-legal DVD release by JEF Films, you owe it to yourself to check out this release. In addition to the uncut print, a handful of bonus features are included. Featurettes on the visual effects of Matthew Mungle and Christopher Young’s score are among the highlights. Also included is an audio commentary with directors Jeffrey Obrow and Stephen Carpenter. Fans of Christopher Young’s score will be pleased to know that an isolated music track has been included for your listening pleasure. The Dorm That Dripped Blood will never be mistaken for some of the better slasher movies of the time period, but it has enough going for a single watch. I make no promises that you won't be bored occasionally, but with the right group of friends, I can see this one being fun. In a dry period for rare horror films coming to the digital format, this release is a reminder that quality releases can still see the light of day. Rent it!